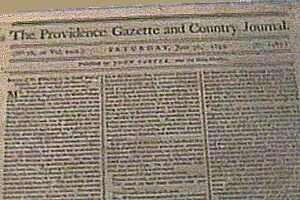 The news of my arrival at the station spread with great rapidity. The two spies took the intelligence, that evening, as far as Coe's station, and the next morning to Reed's station, to my husband. It also reached Pittsburgh that same evening. And the next morning, a young man who was employed by the magistrates of Pittsburgh, came for me, to go immediately to town, to give in my deposition, that it might be published to the American people. Being unable to walk, or ride on horseback, some of the men took me and carried me into a canoe on the river, and took me down in this manner; and when I arrived in Pittsburgh, I was taken from the canoe, in the arms of the men, to the office of John Wilkins, Esquire, the father of the Hon. William Wilkins, judge of the United States Court. The deposition which I then gave in was published through the Union, in the different newspapers of the day, and has since been preserved, and may be read in Loudon's Narratives of outrages by the Indians, vol. 1, p. 85. As the intelligence spread, the town of Pittsburgh, and the country for twenty miles round, was all in a state of commotion. About sunset the same evening, my husband came to see me, in Pittsburgh, and I was taken back to Coe's station on Tuesday morning. In the evening I gave the account of the murder of my boy on the Island. The next morning, (Wednesday,) there was a scout went out, and found it by my direction, and buried it, after being murdered nine days. Massa Harbison went on to raise a large family; her descendents continue in this area today. The cemetery near the site of Reed's Station. The legible stones date from the 1880's; the smaller brown stones with no visible epitaph probably mark the graves of the pioneers. Whether Massa's 5 year old, who was killed on Todd's island was returned here for burial has not been determined, but the body of her 3 year old and that of the waiter who were killed in the raid are almost certainly here. 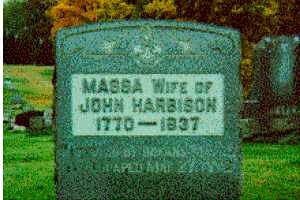 Massa Harbison was first buried near Buffalo Creek and was later moved to Freeport Cemetery. 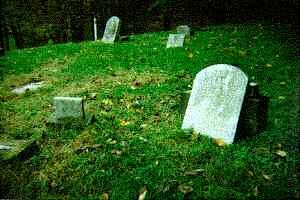 Take "A Look at Local Cemeteries"